By now, the two aforementioned stories have been largely caught up. 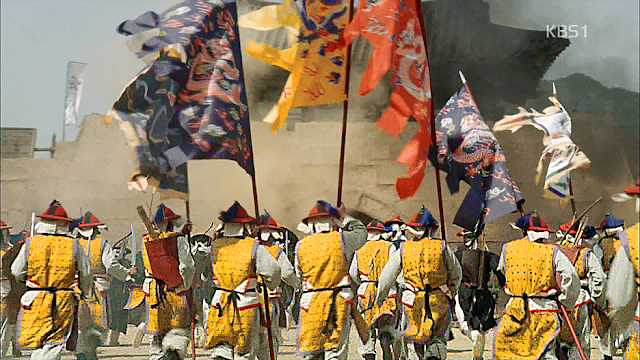 It was when Hideyoshi had his last at Hansando that the Ming relief column was repelled from Pyongyang, and when the Wanli Emperor ordered the assembly of the Ming Southern Army for their arduous march. Korean Court historian Ryu Seong-ryong (the Prime Minister of Korea at this time and Yi's best friend from childhood) stated that the Korean naval victory stalled the entire strategy of the invaders by "cutting off one of the arms" with which Japan tried to envelop Korea, isolating Konishi Yukinaga's army at P'yongyang and securing Chinese waters from the feared Japanese attack, such that "the Celestial Army could come by land to the assistance" of Korea. 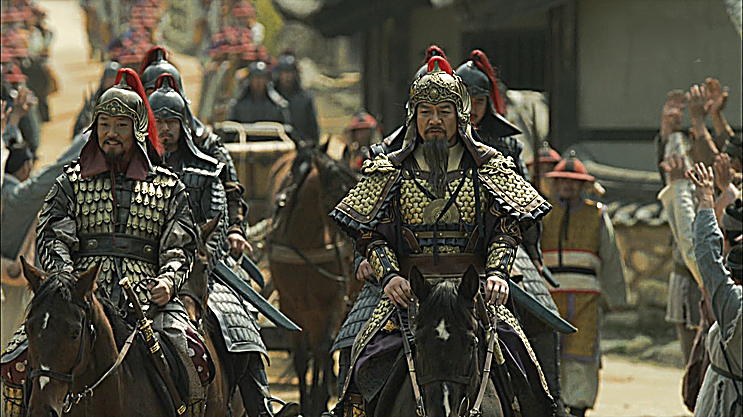 By autumn, the Ming forces crossed into Korea, under the guidance of Li RuSong, an ethnic Korea general whose family had lived in China for generations. His father, if you recall, was the governor of Liaoning who had sent the expedition. 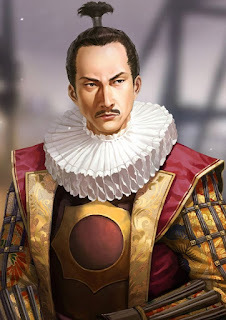 Trouble had long brewed along the northern Chinese boarder, and there was a certain Jurchen (Manchu) upstart named Nurhaci that was causing all manner of trouble in his quest to bring all the Jurchens~ who had been allies to the Ming, to become his personal henchmen. But this more pressing issue needed Li's attention, and because of his natural born expertise in the Korean language, he was sent as the head of the 36,000 expedition. As an aside, 3000 of this Southern Army was personally trained and had fought under the famed Ming general Qi JiGuang who had only decades ago pacified eastern China by driving out all of the Wokou (ronin) pirates. 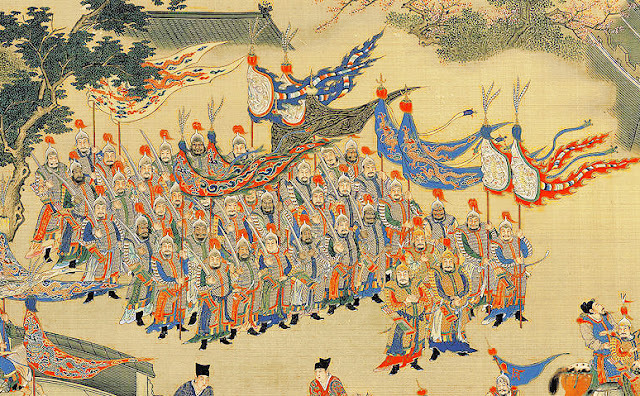 If you remember from the previous article, a testament to the Wanli emperor's mentor: Zhang Ju Zheng's reforms.These men~ and more importantly, their experiences against Japanese the fighting style of Japanese raiders, ronins, and Japanese fortifications would be instrumental in the permanence of the allied army in the battles ahead. 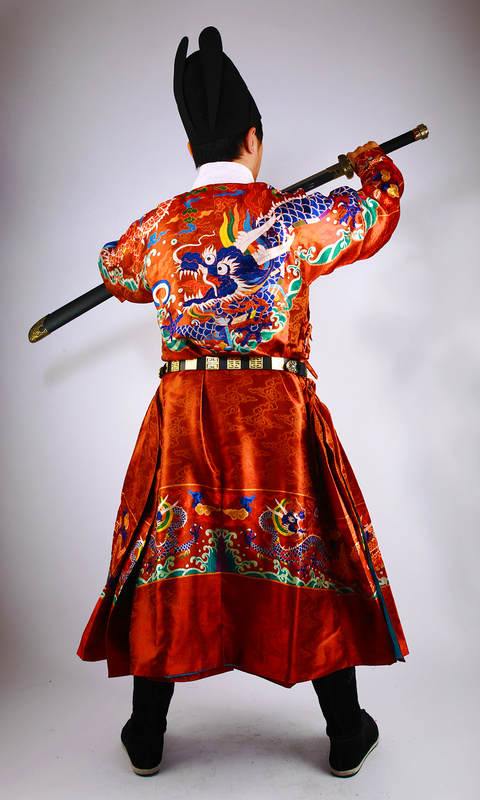 When Li arrived in Korea, he was appointed by King Seonjo to be the supreme commander of all fighting forces in Korea. He promptly sent out letters to the samurai commander garrisoned at Pyongyang: Konishi Yukinaga, but negotiations broke down. Around January skirmishes began between the two armies around the Pyongyang outskirts with the Ming attempting to dislodge the Japanese supplies while the Japanese tried to raid the fortified Ming camp at night. Though outsupplied, the Japanese had erected a strong citadel within the center of the city. This battle probably saw the largest use of artillery in the 16th century, as both armies used state of the art firearms and cannons. The Chinese had amassed an arsenal of 200 pieces of various types of artillery, including rocket arrows, breech-loading cannon and several large caliber "Great General" (Portugese) cannons. 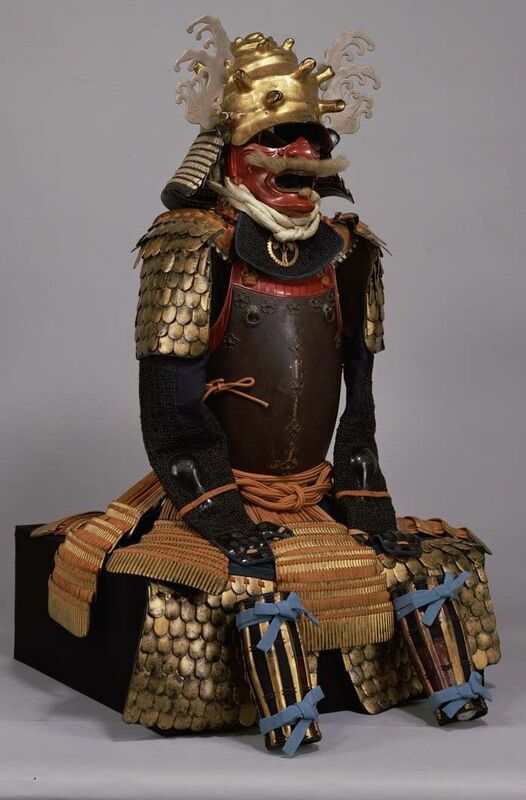 On the Japanese side, Konishi~ like many of his contemporary Kyushu (southern Japan) daimyos, were experts in European gunnery as well, including the many breech loading swivel guns that could blast a storm of shrapnels at scaling troops. could obliterate whole waves of climbers in a constant stream of lead. The southern end were mostly Ming forces disguised as Korean soldiers, this was because the Japanese did not think highly of the fighting abilities of the Koreans, to confuse the Japanese defenders, while the North end was led by Wu Weizhong 吳惟忠 and his southern troops along with the Korean Monk warriors. Their objective was to take the high grounds on Mt. Morobung (directly below the Japanese citadel) just north of the city. On the gray dawn of January 8th, Li ordered a massive simultaneous assaults from all directions around the city. The fighting was fierce on all fronts; on the north end they directly stormed the Japanese position, Wu Weizhong was hit by a bullet to the chest but managed to continue commanding. straining the defender's gun emplacements. On the southern end, the Japanese were confused by the disguised soldiers and thought that the allied forces were not going to actually attack from that side (as the reputation of the Chosen court army was quite poor at this time). 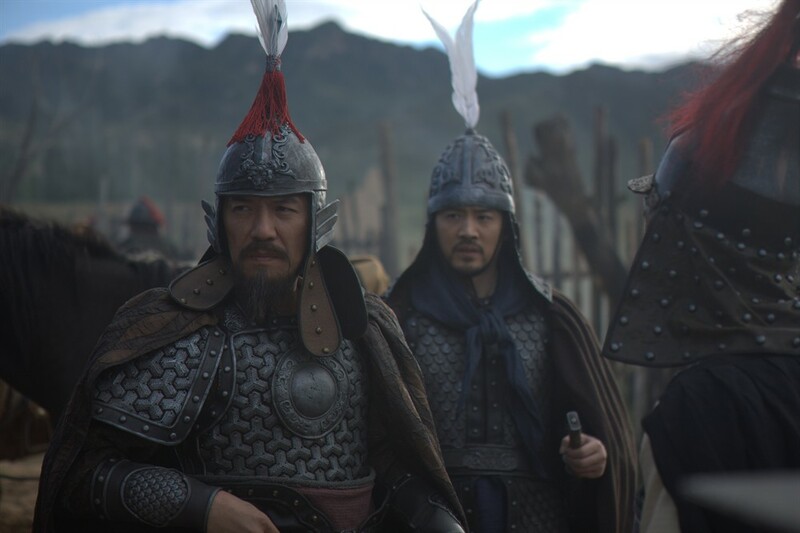 However, they were taken by surprise by the army, which was revealed to mostly consist of Ming soldiers and attacked the Japanese's position. The western end was where the heaviest fighting occurred, Li Rusong's horse was shot from under him and briefly fell into a pit, Li Rumei (Li Rusong's brother) took an indirect arquebus shot to the helmet. Many of the allied generals climbed up the ladders with their men and fought on the walls. Before noon, with his forces in trouble on all fronts, Konishi decided to pull his men back into the citadel they had recently constructed. For the besiegers, the march up the inclines of the trail would be perilous and the Japanese had already stockpiled many muskets and cannons along the path. At different intervals~ the "citadel" consisted of several wooden ring forts that made assaults extremely difficult. Instead of pushing in an all out assault against the citadel itself, Li ordered the Chinese- Korean troops to pull back out of the defender's line of sight, and purposely left a seemingly undefended pass that would enable a swift night retreat. 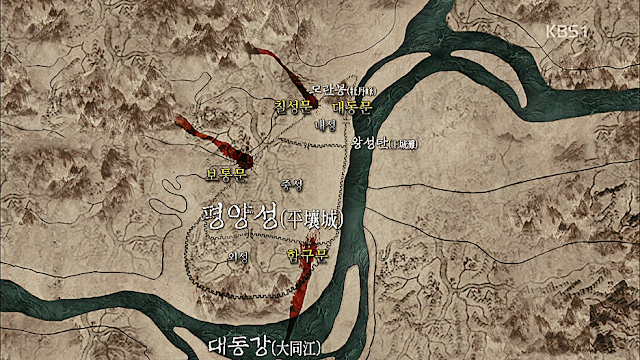 Yukinaga took the bait and quickly sallied out with his entire garrison from the eastern gates toward the direction of Seoul. 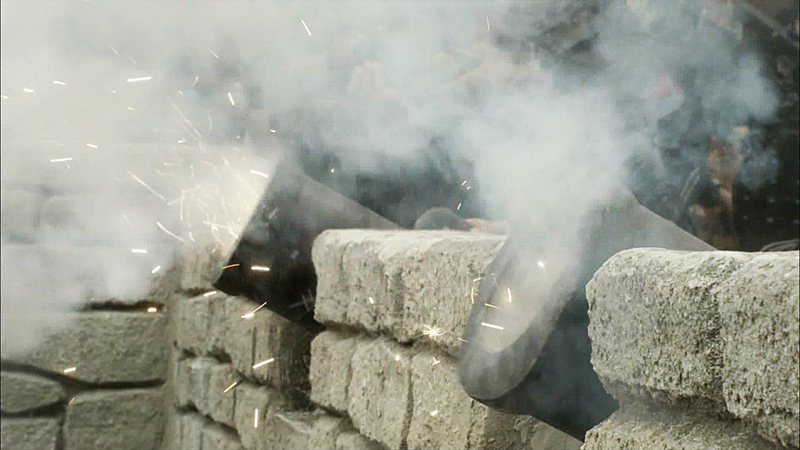 During their "escape" the Chinese- Korean army ambushed their column from three sides and destroyed it with heavy casualties. The organized retreat collapsed and became a desperate full out rout. Yukinaga barely made out the fray with the bad news that the Ming~ like the Japanese fielded large corps of musketeers, and they were well trained to use them. The allied forces had lost less than 1000 men in the sudden assault, for Yukinaga's forces, nearly 11,000 out of his 18,000 army were killed, nearly 60% of all the Japanese forces in Northern Korea collapsed. Within 10 days, another key city- Kaesong, fell to the Chinese- Korean alliance. Flushed with these early victories, the allied column of 20,000 (with few thousand garrisoning Pyongyang) made their way swiftly toward Seoul, hoping that the sudden momentum would leave little room for the Japanese to gather reinforcements and (properly) fortify Seoul. Along the way, a large scale skirmish erupted between the Ming and the Japanese near Byeokjewan, a small village just north of Seoul. The splinter groups of both side of the brawl raced back to their respective commanders, as the site of the battle was only miles away from Seoul, the Japanese commander, a veteran by the name of Tachibana Muneshige, became aware that the allied column was but a fragment of the main host, immediately, Muneshige summoned his whole corp of 30,000~ 40,000 troops and positioned themselves in ambush around the coming direction of the allied column. 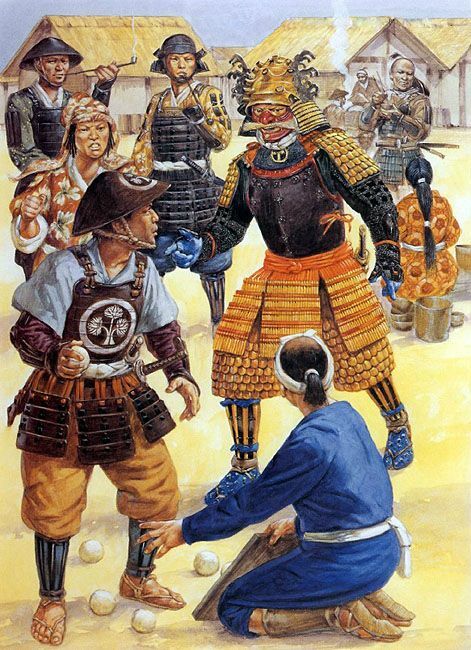 To pin his foe and to exploit his enemy's haste, Muneshige only sent out a small detachment of 500 soldiers, which snowballed with the skirmishers and retreated in seeming disarray. The allied army took the bait, a portion of them gave chase and suddenly found Munishige's 3000 veterans coming behind them in a flanking maneuver. 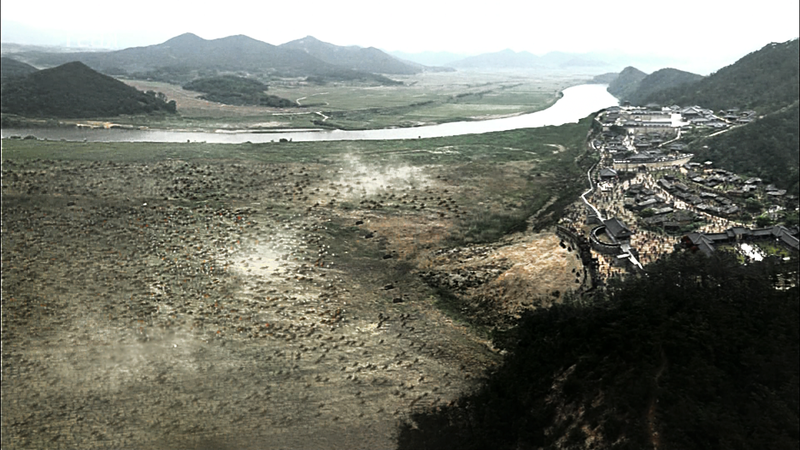 They were pulled back but by now were trapped along the hills and separated between Li's majority by the enemy. 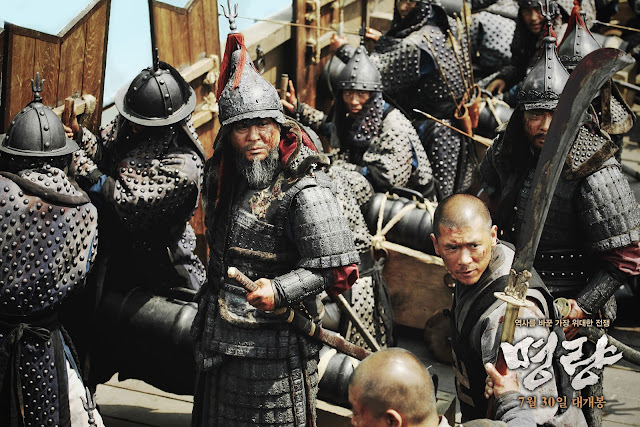 When Li became aware of his soldier's plights, he took to the front with a large host of his troops. But when he met up with his trapped troops around noon, he spotted three giant columns of Japanese relief forces all commanded by various colored banners converging near the hills. 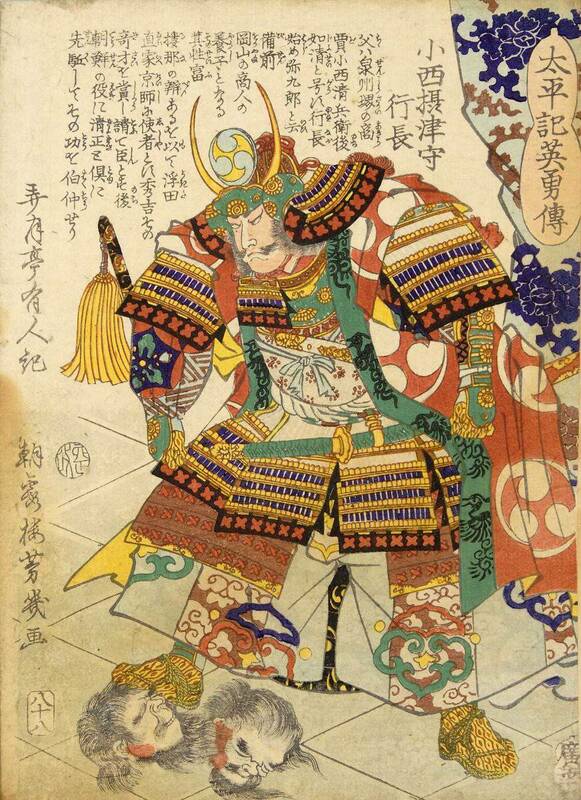 Tachibana Munishige, Ukita Hideie, and Kobayakawa Takakage, three of Hideyoshi's right hand men were there each with their full host of 8000 commanded veteran samurais. 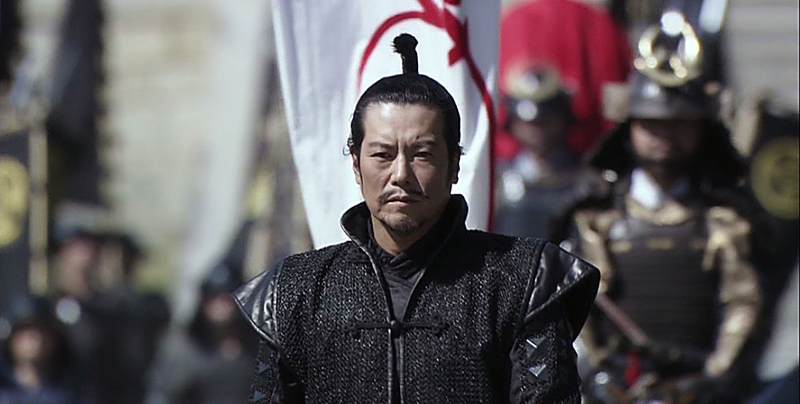 Let's also not forget the disgraced Konishi Yukinaga from earlier, as well as 5000 men commanded by Hosokawa Tadoaki. Li was now trapped with his scouts, with no more than 2000 men facing a combined force of nearly 40,000 men, ourflanked on two sides and unable to truly exploit their cavalry because of the muddy field. With no where to run, Li's soldiers dismounted, took to the nearest defensive positions and drew out their sabers. The Japanese forces advanced on the Ming position around 10 am. The two armies circled around each other like two predators, then charged. 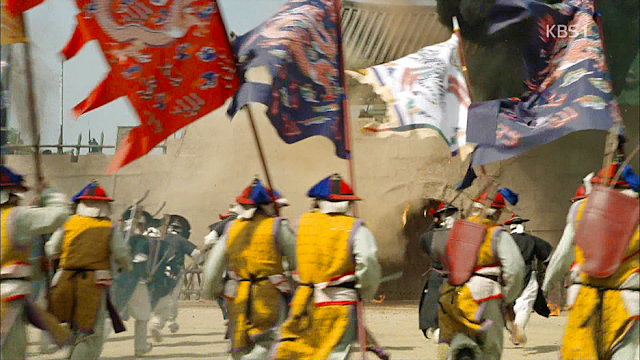 The initial attack by Ukita Hideie's forces was pushed back by the Ming, and then came an all out advance with Muneshige's force coming in from the right, Ukita Hideie's force coming in from the front, and Kobayakawa Takakage's force coming in from the left. Three simultaneous charges came from 3 separate flanks and clashed upon the Ming square. 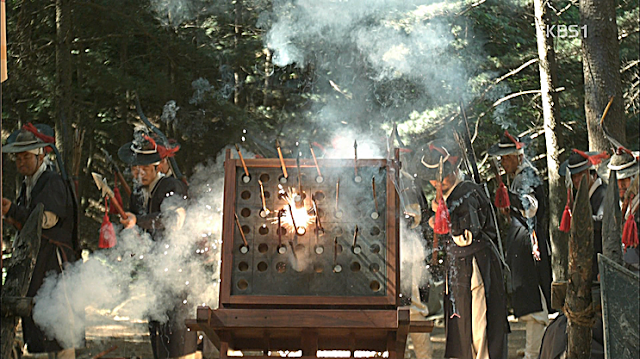 Muneshige's forces fired off a volley of teppō (matchlock hand cannon) before charging head on into the Ming forces. 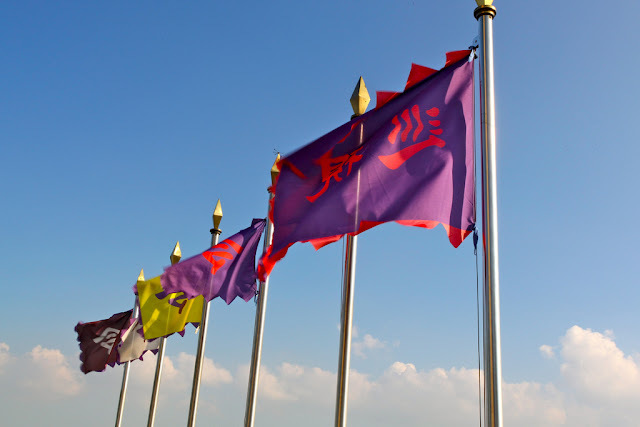 The bright colors of the banners and uniforms splashed in the thick churning mud, boots and sandals sloshed in the wet earth. 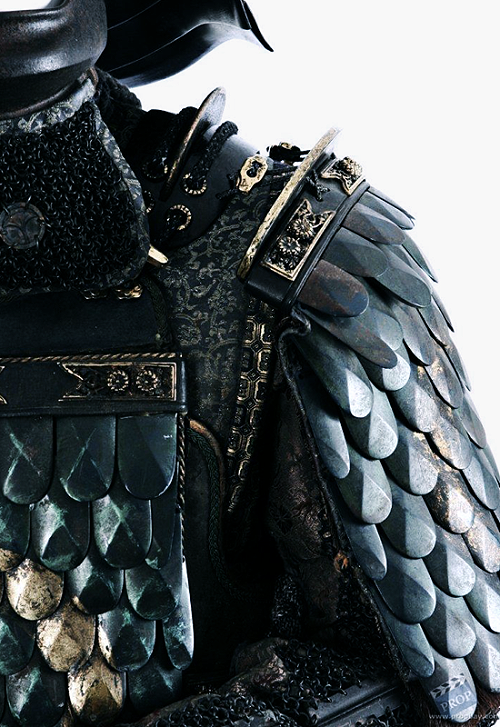 It was like a duel of two scorpions, two claws and a tail lashed, feinted, then zigzagged, the young Ukita Hideie and his giant clan army would try to exploit every possible opening in the Ming army while Munishige would stubbornly bore on forward. 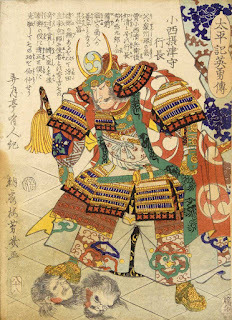 Among them waded Kato Kiyomasa, -that Kato Kiyomasa, the austere- spartan warhawk, the samurai of samurais reduced to just 'grasp the sword and die,' who was so zealous about his brand of Nichiren (Japanese) Buddhism that he ordered his men to cut open the bellies of all pregnant Christian women and cut off their infant's heads, the famed tiger hunter~ now he led on with his forked warspear. 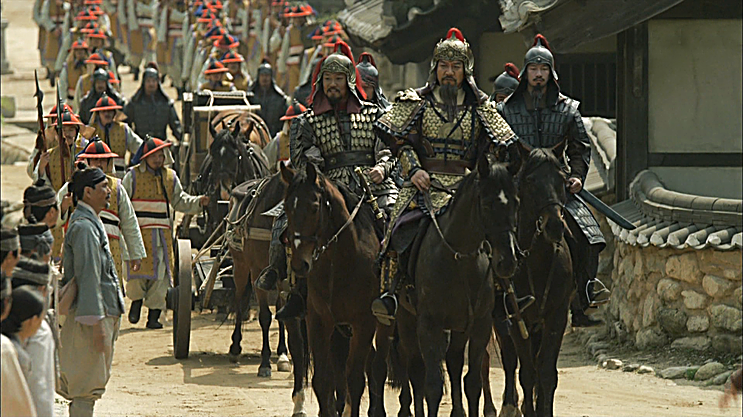 In the horizon small streams of Chinese- Korean soldiers began to arrive and join the fray. 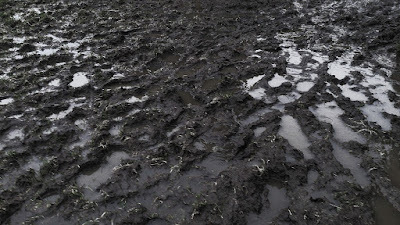 Blood churned in the wet earth until it was ankle deep- then it became a blind brawl. 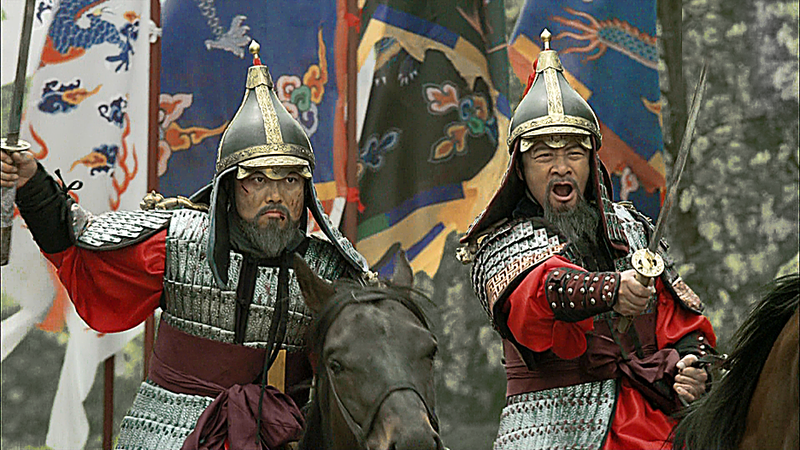 The Ming forces were without their heavy equipment or infantry support, but were made up almost entirely of their most elite retinue of cavalry. 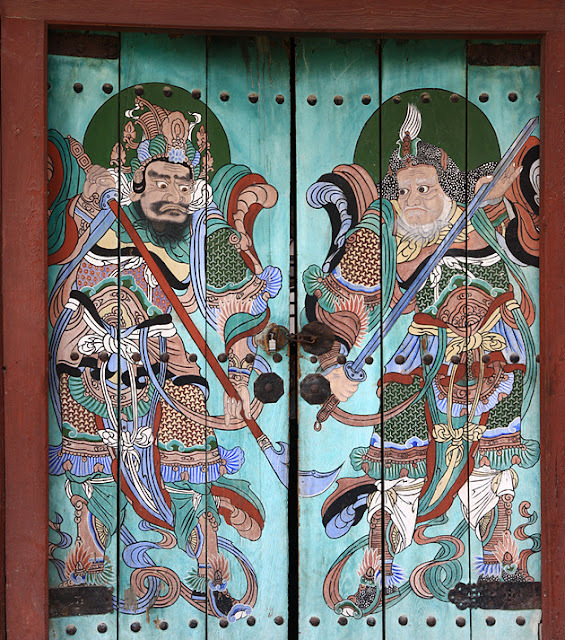 The two sides clashed and the Ming generals themselves were forced to fight in hand-to-hand combat for most of the battle. Li Rusong's brother, Li Rumei, shot a samurai warrior (Ono Nariyuki) at point blank range as he was about to duel with his brother. One of the Ming officers, Li Yousheng (李有聲), was killed while trying to defend Li Rusong. 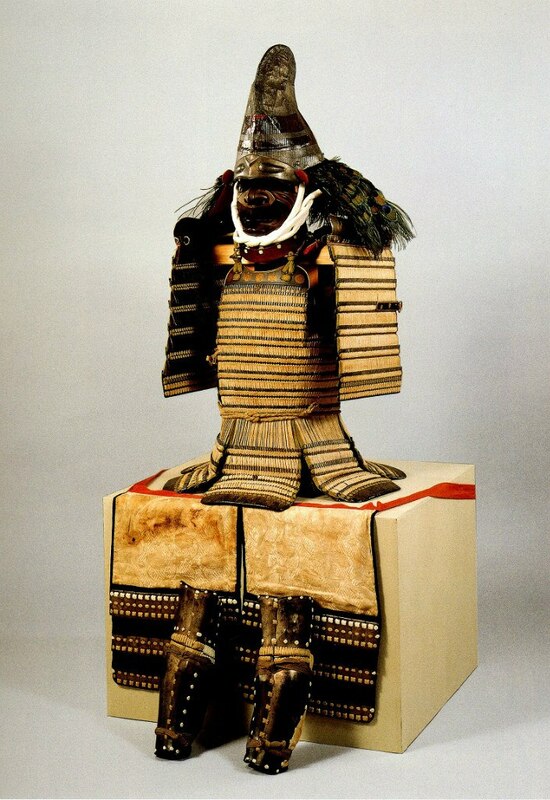 Several samurai of note also perished in the battle, Tachibana Muneshige would loose nearly 2/3 of his core retainers. The all-out brawl continued from 10 am to midday, while Japanese forces sent several waves up against the Ming position and both sides took significant casualties. 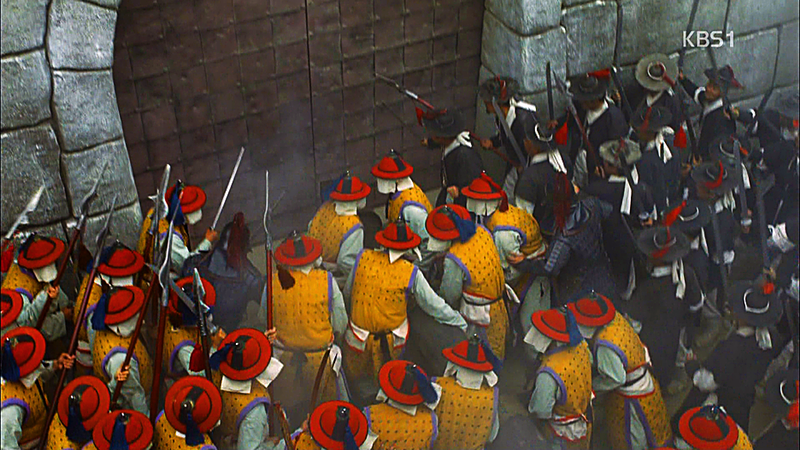 By now other seperate detachments from the Ming army start to arrive piecemeal, which as of now still retained their 18,000+ manpower. Around noon it started to rain, and the broken ground began to resemble a swamp, making the melee fighting difficult. 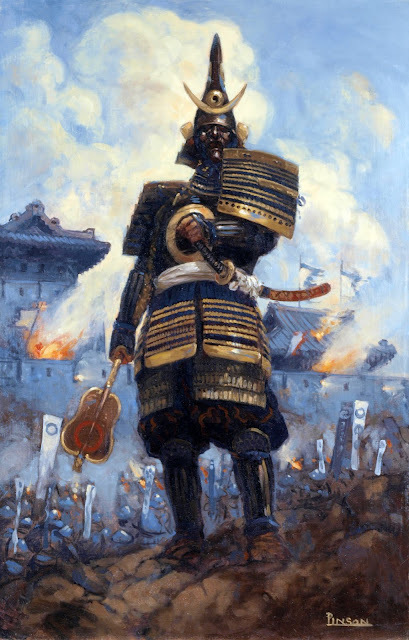 Changing tactics, Kobayakawa drew back his samurai to allow a field of fire for his arquebus squads, which shot bullets into the mass of Chinese and Koreans. The stream of bullets came through the thick veil of rain as men shouted and died, two, three, four hours passed like this, still, the columns of Chinese-Korean relief arrived piecemeal, but the allied line began to falter. The Japanese pursued the splintering Ming army back up the pass to its highest point, where they resisted until 4 pm and then fortified. 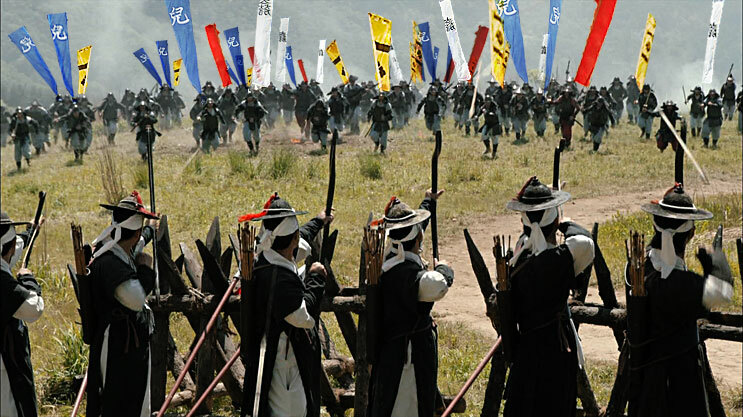 Battle would rage on inconclusively after few more hours of fighting, by then, the rain had made gunpowder nearly useless for the musketeers on both sides and the drums of 7 pm could be hear in the distance- Kobayakawa ordered further attacks to cease as darkness fell. The pitch battle had lasted for over 8 hours and both side are exhausted and severely hemorrhaged, huge swathe of Li's initial 2000 had perished, and great chunks of the Japanese army was also badly bloodied. By nightfall, Li regrouped with the full host of his army. The Japanese forces, not ready to commit to an all-out field battle with the Chinese-Korean main force, pulled back towards Seoul, and the Ming army pulled back towards Kaesong. 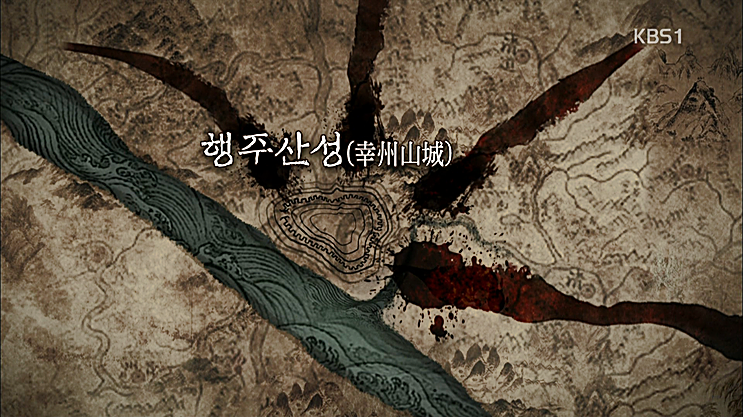 For the moment, Seoul was secured for the Japanese. Despite the prolonged excursion, the battle was just that~ a meat grinder. Neither side gained anything from the conflict, and the situation remained as it were the week before. Both side reverted to their prior state and declared victory. Muneshige's initiative to throw all of his forces at once was instrumental in rebuffing the allied invasion, but the generals had hoped for a complete destruction of the enemy forces, knowing full well now Li would come back as soon as he gathered reinforcements. 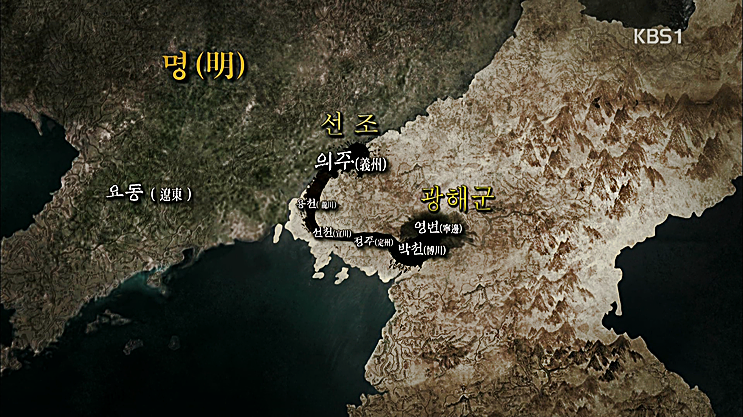 In the time being the Japanese would try to secure their gains by pacify the regions near Seoul. No clear figure of casualty was accounted for as Li immediately went back to recuperate his losses and the Japanese generals promptly went after a nearby Korean garrison at Haengju merely days after this blood letting. Investigation from the Ming court estimated that the Ming had lost at least 2000 men, the Japanese reported having killed 6000, though the Koreans disputed both, both allied and the Japanese commanders severely downplayed their losses in the reports, with Li reporting that he had lost no more that 120, while the Japanese reported that they had lost not more than (selfsame) 120. 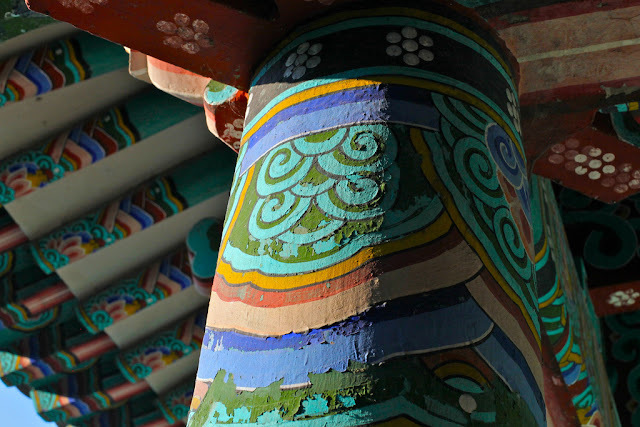 Li would bounce back in two weeks outside Seoul's walls with a refreshed host. This time, the Japanese did not offer ambush or a massive preemptive attack. In the interval of the Ming army's return, the Japanese generals had been distracted elsewhere, and their distractions would spell catastrophe for them. 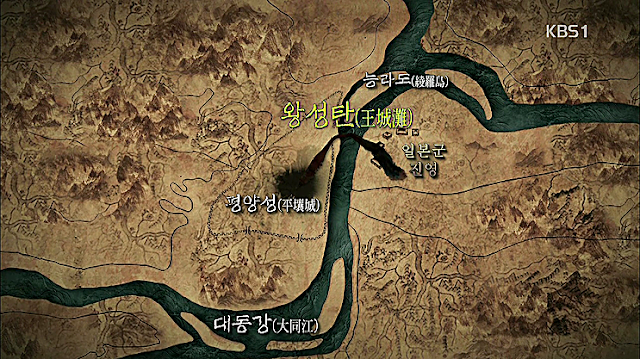 When the allied army retreated toward Kaesong, 3000 Peasant militia were en route to join Li Rusong's army. They had been a lone holdout detachment- as Joella (the HQ Province of Admiral Yi on SW part of Korea) had stubbornly resisted all attacks throughout the Japanese advance. 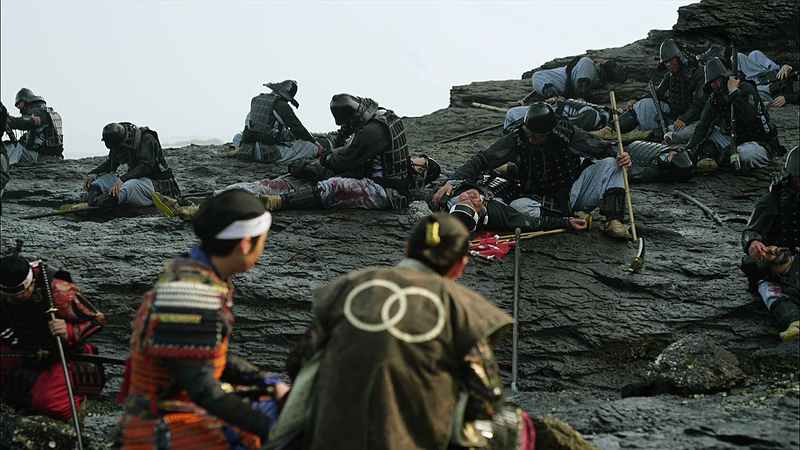 Unlike the rest of Korea~ which had lost both land and sea, Joella's coasts were secured by Admiral Yi's series of spectacular victories. 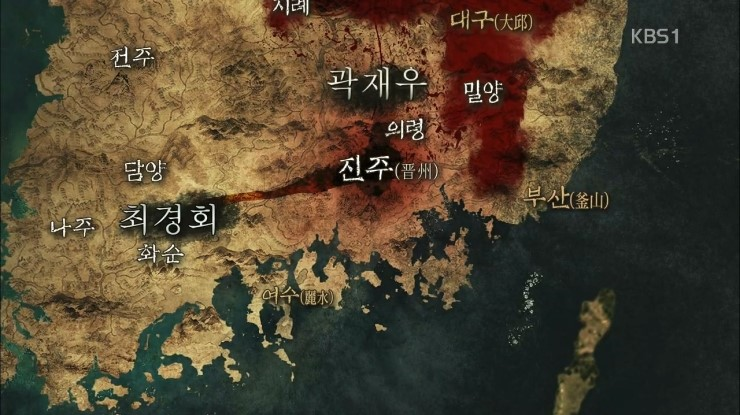 They would be all the province could muster in a desperate gamble to liberate Seoul in conjuncture with the massive relif column from the north. 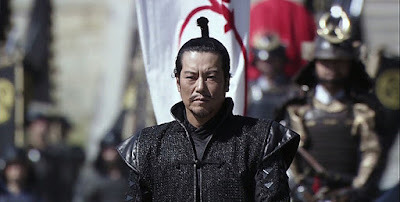 What they didn't know was that 30,000 Japanese, commanded by the finest samurai generals (perhaps ever) are marching against them with full speed. 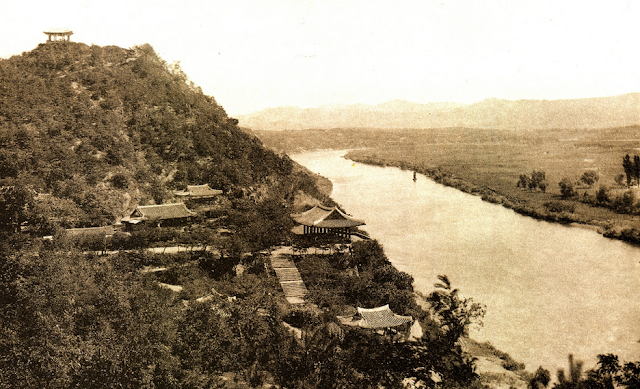 Joella province, situated on the SW portion of Korean, the Japanese had landed at Busan (SE) part of Korean and made it a land bridge for their rapid advance. But because of Admiral Yi's victories around Joella, the province would hold out to launch attacks into the Japanese flanks. 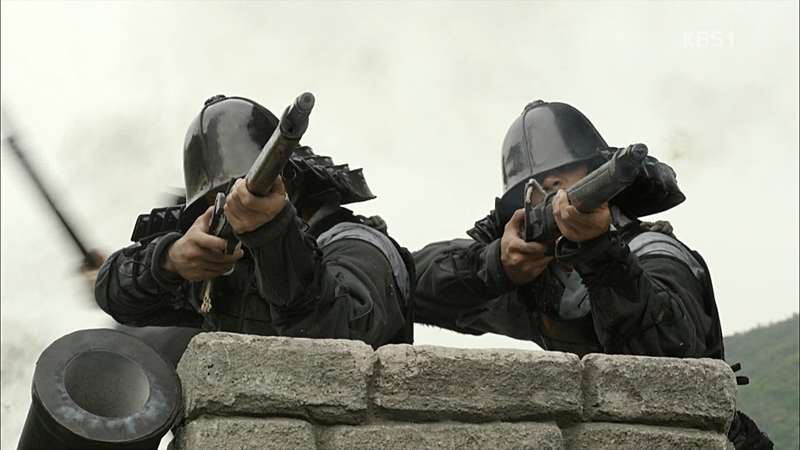 When Seoul, barely north of them~ was taken, the Joella commanders had held their ground and patiently hid their troops in the hills, they waited for a right moment to take back the capital. 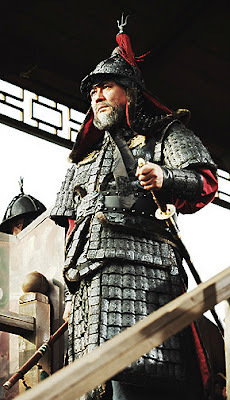 When they received the news of Pyongyang and Kaesong, Kwon Yul, their garrison commander marched them quickly northwards, re-taking Suwon and then swung north toward Haengju near Seoul where he would wait for the Ming reinforcements. 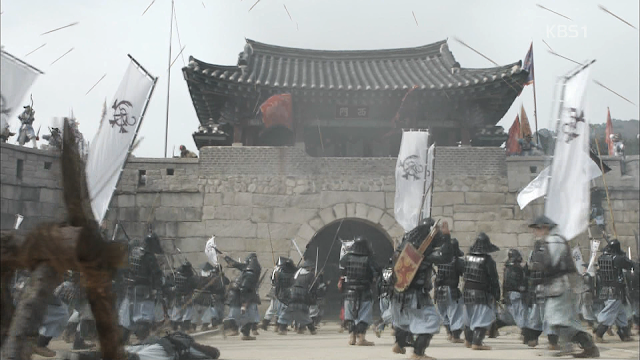 After he was informed that the allied army was pushed back at Byeokjegwan, Gwon Yul decided to fortify Haengju. 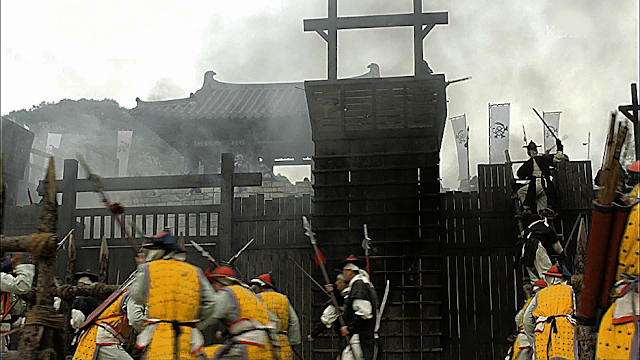 With not even two weeks after the mud slog at Byeokjegwan, the 20,000 Japanese garrison at Seoul, lead by the hawkish Kato Kiyomasa advanced rapidly toward the small "stolen" fortress, though they had retained a breathing space after the previous two week's nightmare, their supplies were running out~ this combined with Admiral Yi's raids had caused a complete cessation of supplies from the mainlands to the west coast of Korea, Therefore, it was crucial for the Japanese forces to finish the siege quickly. Mon crests of Ishida Mitsunari, Ukita Hideie, Kato Kiyomasa, Konishi Yukinaga, Kobayakawa Takakage, Kikkawa Hiroie, Hosokawa Tadaoki, Kuroda Nagamasa, Otani Yoshitsugu. 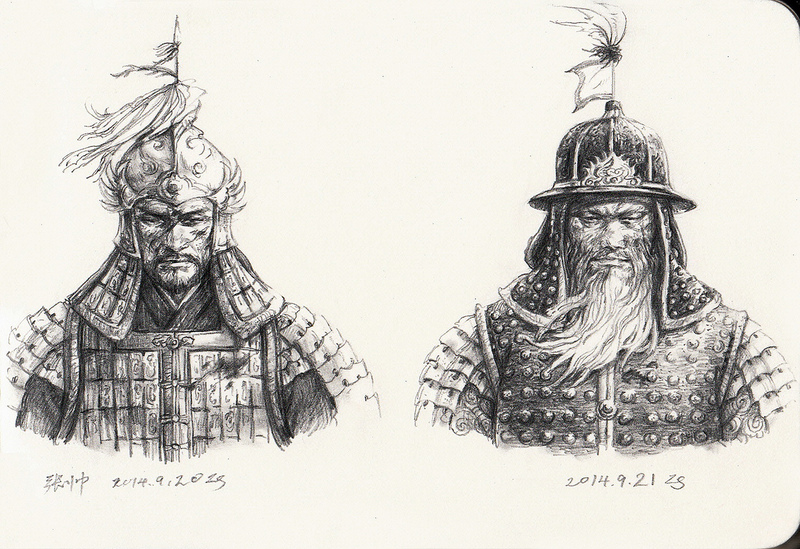 Nearly all of them would participate in the Sekigahara campaign on either side of the civil war. While called a mountain, it is more accurately termed a hill, being only 413 feet (124 metres) high above sea level. 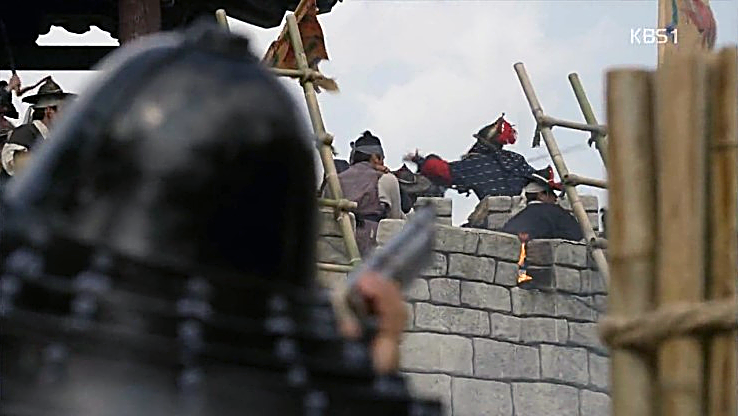 On arrival, Kwon Yul's army built field fortifications, consisting of 10-foot (3.0 m) high earthen walls reinforced by a wooden palisade. The construction took three days. Sufficient arms and supplies were stocked in the fortress, and most importantly~ around 40 hwachas (화차) or rocket carts were positioned on the fortress wall. 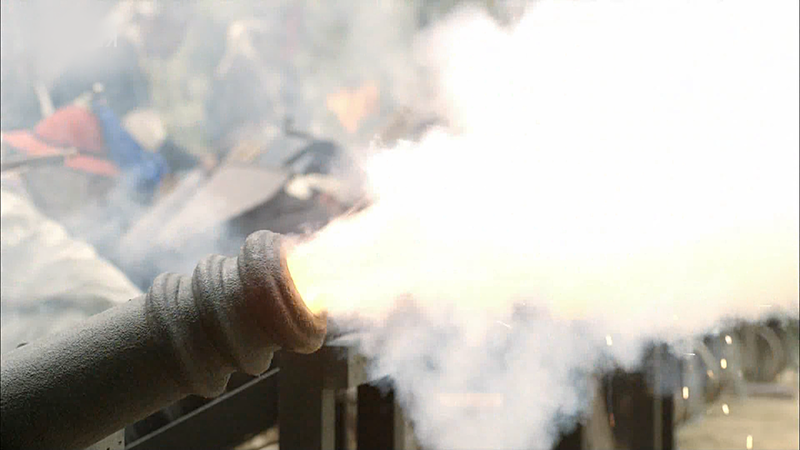 Welcome to an instant barrage, where one man with one torch = a regiment of already strung archers. The hwacha's structure was very similar to a handcart, with a mobile wooden launchpad on the top containing 100 to 200 cylindrical holes, into which igniters like those of the sajeonchongtong (사전총통) were placed. The ammunition, similar to the ancient Chinese fire arrows, consisted of a 1.1 m long arrow with the addition of a gunpowder-filled paper tube attached to the shaft just below the head. Approximately 100 projectiles were loaded and launched in one volley. Operators used to fire the weapon at an elevation of nearly 45° to maximise range. Adverse weather conditions (wind, humidity, rain) during a battle generally limited their striking distance to about 100 m. But Hwachas' range could be extended if the siege weapon was situated on a hill or other elevated place, (which offers a significant offensive bonus for being situated around every possible point of Japanese attack) arrows fired from that position had a range of about 500 yards (≈450 meters). Ukita and Kato attacked from all directions against the small fortified hill. They marched in dense columns intending for maximum efficiency in a charge, but it is precisely such dense formations that made them extremely susceptible to Hwacha attacks. Having arrived at Haengju at dawn, Ukita divided his force into four groups and surrounded the fortress. Then, having realized that the Korean garrison was vastly undermanned, ordered a general attack~ relying that his numbers would crush the outmatched foes. At 6:00 a.m on 12 February 1593, the Japanese launched their attack by advancing up the slopes of Haengju. A prismatic swirl of banners encircled the forested hills and their shouts seemed to link in unison as they charged forward. Then the Hwachas began to fire storms of arrow right into their densely packed center. The Japanese came as they did in most of their battles~ ie. in the fuedal manner where units are bundled in tight formations for maximum impact in attack and defense, but it is precisely because of this tight deployment that they are extremely susceptible to fire from Hwacha and mortars. A skilled shot aimed at the center of the formation could wipe out whole regiments in a few salvos. As the Japanese soldiers fought to breach the earth and wooden walls of the palisade, the Koreans hurled boulders and tree trunks from their defensive positions, and fired arrows, arquebuses, mortars, and storms of explosive hwachas rocket-arrows into the massed ranks of the attackers. 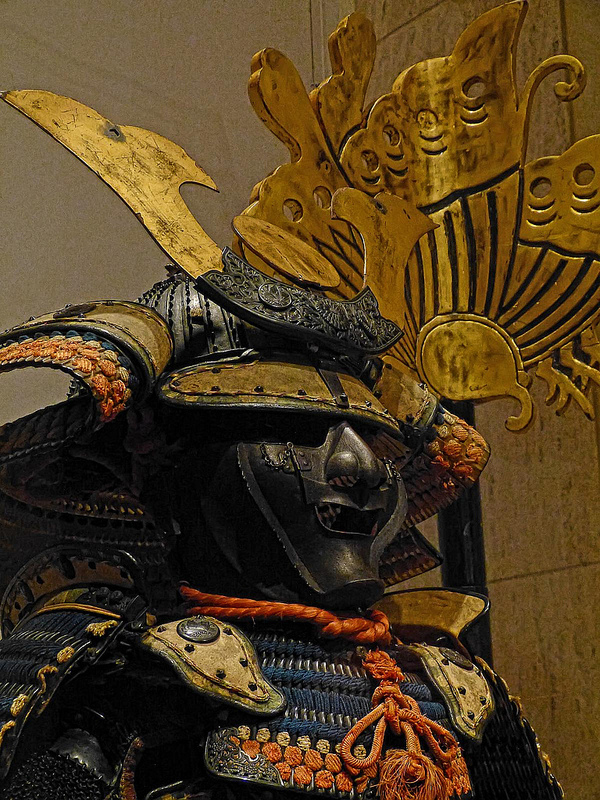 Although the Japanese overran the first line of defense, they could not break through the remaining defenses. A total of nine assaults were ordered against the Korean positions, led by veteran samurais~ including Kato Kiyomasa personally in several daring charges. But after incurring massive casualties and still having failed to overrun the Korean position, Kato ordered a retreat. Ukita and Kato were both wounded. The Koreans inflicted more than 1000 casualties on the attackers and recovered 727 spears and swords from the retreating Japanese. 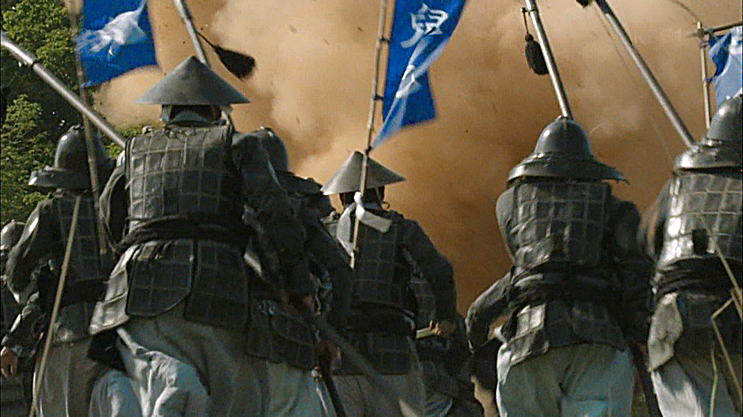 3000 militia of peasants had repelled an army of 20,000 led by samurais at their prime. After the battle, Kwon Yul credited the role of the hwachas in the Korean victory and rode out to rejoin Li's army. This defeat deprived the Japanese of sufficient supplies to move north, and the defeat at Pyongyang had caused part of the Japanese leadership such as Konishi Yukinaga and Ishida Mitsunari to seriously consider negotiating with the Ming dynasty forces. 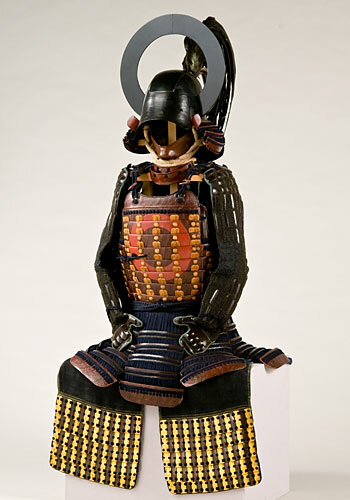 This got them into a heated debate with other hawkish generals such as Kato Kiyomasa, and these conflicts would eventually have further implications following the war in Japan when the two sides became rivals in the Battle of Sekigahara. 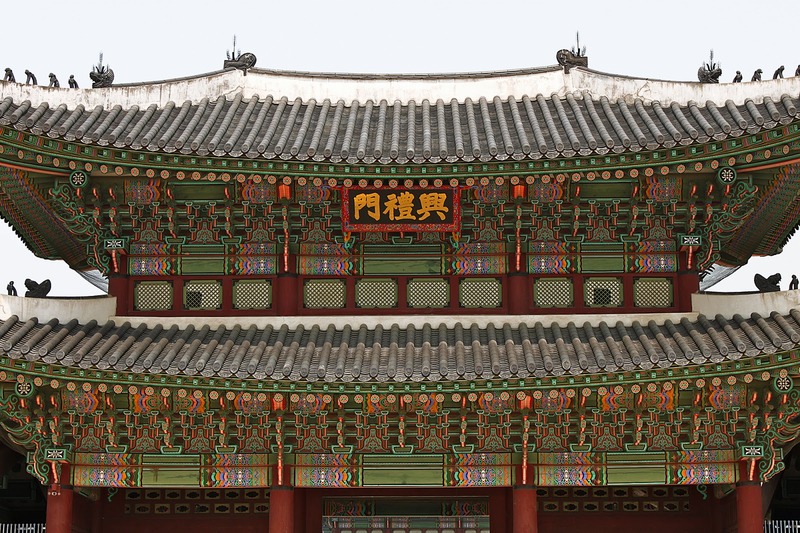 By the time Li arrived with another refreshed host merely two weeks after Byeokjegwan, and days after Haengju, the Seoul garrison was in dire straits. Li immediately surrounded the city and the Japanese were forced to settle for a prolonged siege they are not prepared for. 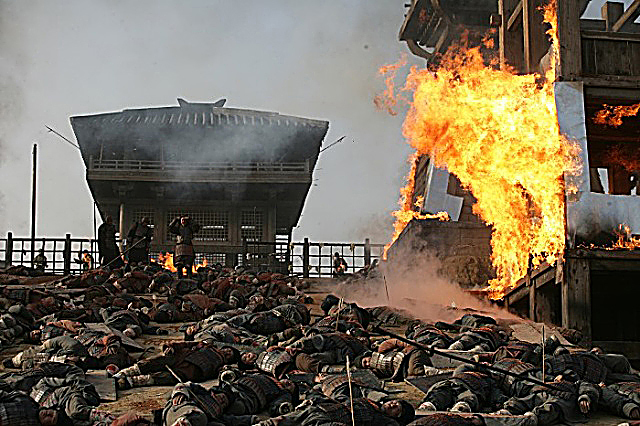 That~ coupled with Admiral Yi's further raids in 1593~ and the fact that a Ming commando snuck into Seoul's grain storage and burned the majority of it down, the Japanese forces were unable to continue the war due to logistic difficulty, and pulled out of Seoul as part of the peace talk agreement with the Ming forces. Thus ends the first (1592-1593) phase of the Imjin War. There were two factors that triggered the Japanese to withdraw: first, a Chinese commando penetrated Seoul and burned storehouses at Yongsan, destroying most of what was left of the Japanese troops' depleted stock of food. Secondly, the Ming delegate made another appearance to conduct negotiations, and threatened the Japanese with an attack by 400,000 Chinese. The Japanese under Konishi and Kato, aware of their weak situation, agreed to withdraw to the Pusan area in the southern extremities of Korea while the Chinese would withdraw back to China. A ceasefire was imposed, and a Ming emissary was sent to Japan to discuss peace terms. 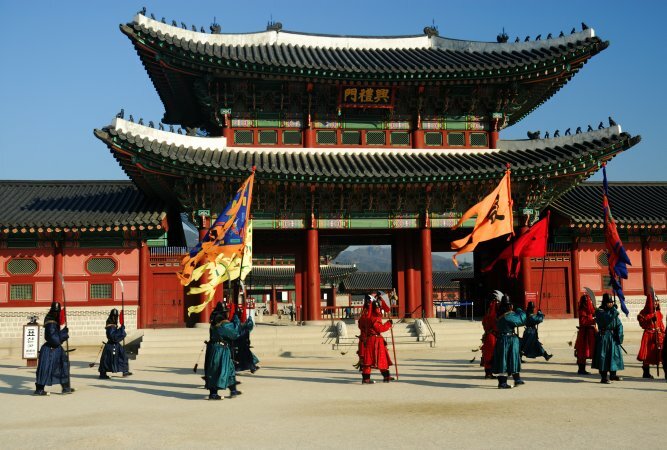 Seoul was returned to the Koreans on April 1593. By summer, King Seonjo had returned to his palace with his court. By May 18, 1594, all the Japanese soldiers had retreated to the area around Busan and many began to make their way back to Japan. The Ming government withdrew most of its expeditionary force, but kept 16,000 men on the Korean peninsula to guard the truce. Though the peace was a much needed respite for the war weary Koreans, it would be disastrous for one man. Despite his loyal services and spectacular achievements against insurmountable odds. In the year to come, Admiral Yi would be unjustly demoted, tortured, and tried for treason to be executed. 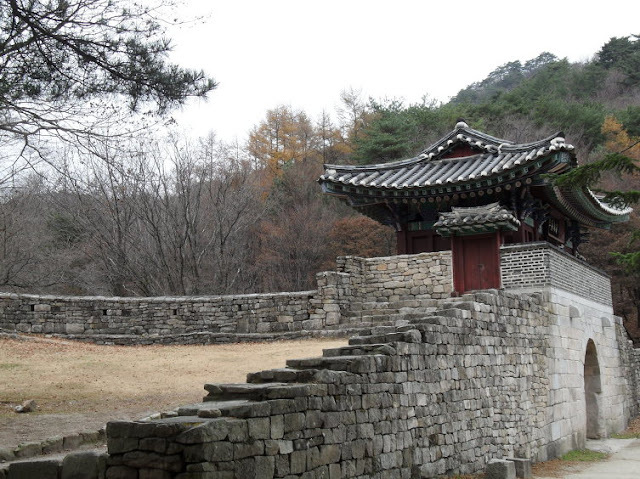 Li Rusong actually had about 3000 troops total at Byeokjegwan, with a later relief force of 2000. This Baidu post contains a very extensive collection of sources regarding the battle of Byeokjegwan from all sides. Japanese side also suffered heavy casualties during the battle, with Tachibana Muneshige alone losing two-third of his men. I forget to add, after the battle a number of Ming troops that were considered KIA or captured before actually returned from the battlefield. What unit was this 'Ming commando' belong to? Are there facts to back up this action during the Seoul siege? I gotta find the source, I read it three two years ago, Hmmm, I'll look it up again. 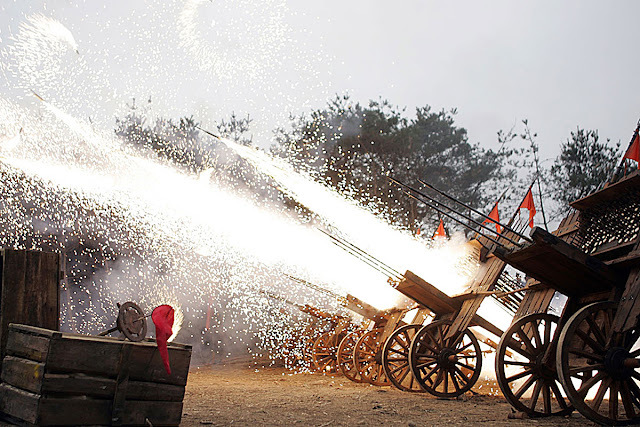 I wanted to ask if the Ming had any rocket launchers, similar to the hwacha?